The White Rose Apartment stands majestically by itself along a small slope of Tanah Rata which can be seen from afar as you approach this town. 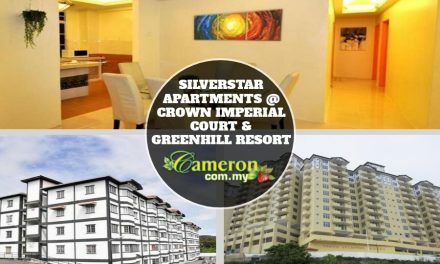 Its snow-white walls provide a welcoming outlook for the visitor especially if you are seeking a comfortable and home-like environment during your stay in Cameron Highlands. Whether you are visiting here for business or leisure, the White Rose Apartment is a perfect stop because it is conveniently located not far from the main entertainment and commercial blocks of Tanah Rata. Apart from the location and environment, you will enjoy the best sights and natural sounds of nature around White Rose Apartment as it is surrounded by some of the most beautiful with amazing breath-taking sceneries of Cameron Highlands. At the White Rose Apartment, you can choose between the apartment units with a balcony which are mostly 3-room units. What makes the White Rose Apartment so special is that you can easily reach the town centre of Tanah Rata which is only a small trip away. This means that you can easily get to the bus station, banks and a lot eating places like restaurants, cafes and coffee shops. Meanwhile, there are ample parking spaces within the vicinity of the premises which would be ideal if you are driving here while free Wi-Fi internet access in the rooms is provided as standard. Besides that, there is a barbecue place here which will be a great option for small groups of friends and families to hold gatherings and get-togethers.